Today David and I are going to give you two short and complementary perspectives on God’s creation and the actions we can take in response to environmental issues. Then we’ll take questions and hear what you have to say. Conferences like New Wine are great at stirring us up and giving us something to think about in our Christian lives and churches. I had one of those moments back in 2014 when [Slide 2] The Rev Dr Chris Wright came to speak at our church. Chris Wright is an Anglican clergyman and an Old Testament Scholar and author. He was the principal of All Nations Christian College and now he is the International Ministries Director of Langham Partnership. Of course we have the very first verse in the Bible, “In the beginning, God created the heavens and the earth.” And the story of creation is spelled out of how God created the sky, the earth, waters, plants and animals and mankind. And what does it say seven times? [Slide 4] That is was good. This verse echoes Genesis 1 verse 1 doesn’t it? “In the beginning, God created the heaves and the earth” and “Then I saw a new heaven and a new earth”. In Genesis 3 death and pain enter, Revelation 21:4 “death shall be no more, neither shall there be or mourning, crying or pain.” Genesis: Death arrives, Revelation: Death leaves. So we can see the story of the Bible, as Chris Wright states, does not begin at the Fall and end with Christ’s return. It begins with creation and ends with a new creation. God calls creation ‘good’ and commands us to look after it. But what does the new creation look like? Is it a case that the current earth will be a destroyed and replaced by a new planet? [Slide 7] Hitchhikers video of blowing up the earth. Bishop Tom Wright is excellent on this theme of New Creation. He said, “There is a great theme in the scriptures which gives meaning and purpose to all of our life.” That theme is new creation. And Wright draws our attention to Romans chapter 8 - one of the most important chapters that explains the good news of Jesus Christ and Life through the Spirit. And what does it say in Romans 8:18-21? 3. renewal of the creation. An important part of our mission and in renewal in the church is to [Slide 10] Care for Creation. So that was a Call to Care, next is a call to action. There has been an awakening within the church worldwide in the last 10 years. Senior Christian figures have called for action on the environment as part of our mission. In 2010 the Lausanne Movement, a core evangelical movement, wrote the [Slide 12] Cape Town Commitment - it is a confession of faith and a call to action. It calls for action on conflict, modern slavery, poverty, disability, HIV, and creation. 3) Recognize that part of the mission of God is the conservation of habitats and species. The encyclical is very worth reading because it is a theological perspective on the environmental destruction of creation and presents ideas for changing direction. So the calls to action from evangelicals, Catholics and all church leaders are sounding the same note – we need to act individually, and collectively through our churches and political representatives. So this leads on to the next theme. For anyone to take action there needs to be a moment in your life that that acts as an emotional trigger. Let me share the story of my emotional trigger. [Slide 15] This is Joshua Cator, an 11-year-old boy from the devastated city of Tacloban in the Philippines. Joshua was swept away by the storm surge clinging to his father, but then the current separated them and he was swept away alone. He survived but his mother and sister had been killed. His town was completely devastated. It was in reading his story that I realised that climate change is not simply an academic argument about how much carbon dioxide causes global warming, it’s about people’s lives. The Church of Ireland Bishop’s Appeal asked for disaster relief funds to help people like Joshua. Like many others, I gave a contribution and encouraged others in the church to do the same. In total, about 200,000 euro were donated. But later that year I discovered the Church of Ireland had millions of euro invested in fossil fuel companies. The church was invested in the industry that causes the pollution that fuels global warming. It was this connection between Joshua and my own giving that was the trigger for me to take action. After reading about the Church’s investments in fossil fuels I started to campaign for the Church of Ireland to remove the invested funds from coal, oil and gas companies – this is called divestment. Divestment sends a signal to other investors that fossil fuels are too high a risk because of climate change and that investing in them is immoral because of the harm they do to people. I spoke at General Synods calling for our church to divest. In 2016 and 2017 the church divested from coal and tar sands, then in 2018 General Synod voted to divest from all fossil fuels by 2022. It resulted in this [Slide 17] headline in the Irish Times. Divestment from fossil fuel extraction companies goes hand-in-hand with corporate engagement with fossil fuel consuming companies. Institutional investors join forces to pass motions at Annual General Meetings to put pressure on companies to rapidly decarbonise their operations and switch to renewable energy. David might be saying more about this shortly. There are lots of ways to take part in campaigns. [Slide 19] Trocaire – Divest Irish Parliament. These websites have all the tools you need to campaign - sign a petition, email your bank, organize an event in your church to raise awareness. Start today [Slide 20] using Trocaire to contact Dail rep before 12 July. Also, build a relationship with your local political representative – even if you did not vote for them yourself, get to know them. Share with them that helping extreme poverty, climate change and reducing pollution are important to you. You could start a blog and document your journey. Other people around the world will gain inspiration on what you have done. Does your church use plastic cups and photocopy too many notice sheets? Raise it with your church leaders and find an alternative. 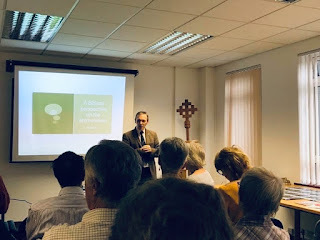 This spring our parish hosted the Diocesan Synod and it was a [Slide 21] Sustainable Synod so we used compostable cups to reduce single-use plastic waste. There are lots of things you can do and there are many ideas on the [Slide 22] Eco-congregations Ireland website. Go flexitarian - some days you eat meat, others you’re vegetarian. Get on your bike – drive less, use a [Slide 24] carpool. Get educated - read quality books, newspaper and websites about how to solve the crises. [Slide 25] Half-Earth – we’re losing species so fast some call it the sixth mass extinction. We need to protect 50% of the earth for nature. [Slide 26] Net zero emissions by 2050 – if emissions from all sectors can be reduced to zero by 2050 then global warming will stay below the Paris target of 2 degrees. The changes ahead are as big the industrial revolution, but they need to happen at the speed of the digital revolution. We need people like you who understand these changes, who campaign and are passionate for more rapid change, who have compassion for the refugee and want to care for creation. It is time for each of us, and our churches, to take action.